Many seniors look forward to Thanksgiving because they get to spend some quality time with the people they care about. However, large gatherings can be stressful if a senior has a memory-related condition like Alzheimer’s. 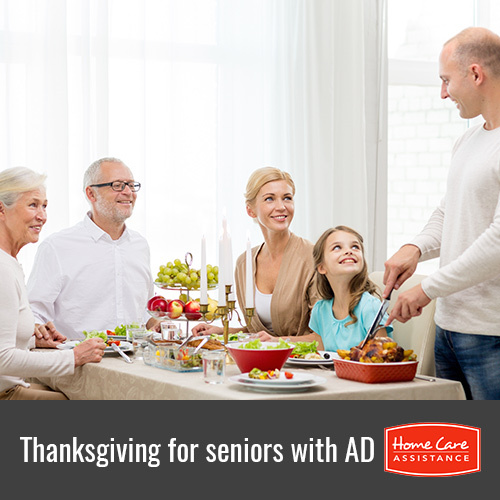 If your elderly loved one is living with Alzheimer’s disease, Harrisburg, PA, Alzheimer’s home care professionals have a few suggestions to make a Thanksgiving get-together easier for him or her to manage. Seniors with moderate to severe Alzheimer’s can often remember events from decades ago when provided the right prompts. A photo album or video montage can serve as a conversation starter between your loved one and your guests. You can also encourage everyone to share their favorite holiday memories or traditions as you enjoy the meal. If guests seem unsure about how to communicate with your loved one, let them know they can always use physical affection. Even if Alzheimer’s makes it difficult for your loved one to communicate verbally, he or she may still be able to understand the power of a touch. A hug or a touch on the hand can be reassuring and express affection to your loved one even when no words are used. Try to incorporate your loved one into the holiday preparations as much as possible. Active participation can prevent him or her from feeling unimportant or neglected and even provide opportunities to create new memories. You can have your loved one set and decorate the table or even stir ingredients for a dish. Try to plan the meal for the time of day when your loved one is most alert, even if it means being a little unconventional. For example, if your loved one feels best in the morning, consider having a Thanksgiving brunch instead of the traditional dinner. You may also want to consider having short visits with various family members throughout the week instead of one big celebration so your loved one does not become too overwhelmed by the noise and activity. It can be difficult for seniors with Alzheimer’s to participate in long conversations involving multiple people. Consider offering group activities that do not require extensive focus. For example, you can pull up chairs around the TV and watch a classic movie or a parade while waiting for the turkey to cook. Living with Alzheimer’s can be difficult to manage, but your loved one can live a happier and more comfortable life with the help of Home Care Assistance. Our caregivers are expertly trained in Alzheimer’s care and can help your loved one remain safe at home by helping with tasks like medication reminders, cooking, and exercise. For more information on the elder care Harrisburg seniors and their families rely on, call one of our knowledgeable Care Managers at (717) 540-4663 to schedule a free consultation.